Jean Lave and Etienne Wenger argue that learning is necessarily situated, a process of participation in communities of practice, and that newcomers join such communities via a process of ‘legitimate peripheral participation’—or learning by immersion in the new community and absorbing its modes of action and meaning as a part of the process of becoming a community member. 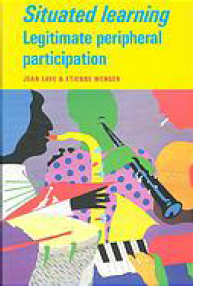 [L]egitimate peripheral participation is not itself an educational form, mush less a pedagogical strategy or a teaching technique. It is an analytical viewpoint on learning, a way of understanding learning. [T]his viewpoint makes a fundamental distinction between learning and intentional instruction.